When it comes to playing laser tag, Southern Illinois University Edwardsville Police Officer Brandon Sellers enjoys the competitive fun. The laser tag game at Edison’s in Edwardsville was just one of the many fun activities that Sellers and seven other Metro East law enforcement officers participated in as part of the annual Police and Children Together (PACT) summer camp, which began Monday, June 20. The camp ends Friday, June 24 with a “graduation” ceremony at Splash City Family Waterpark in Collinsville. “The camp was established to give boys and girls, ages 9-13, an opportunity to become involved in positive summer activities and to promote a positive image of police, community and of themselves,” said Sellers, who has participated in the PACT camp four times. Other police units participating are Cahokia, Edwardsville, Fairview Heights and Collinsville. The Collinsville Police Department is sponsoring the camp. A school resource officer from Lincoln Middle School in Edwardsville is also part of PACT. Those selected to participate in PACT are encouraged to and do attend for as many as four years. The children also receive a $100 gift certificate from Walmart or Target at Christmas and McDonald’s coupons for a meal on their birthday. Monies for PACT and gifts for the children come from the sponsoring police departments and the Law Enforcement of Illinois (LEFI). LEFI, who has given PACT a $5,000 grant for the past three years, started the summer camp 20 years ago in several parts of the state, according to Joy Davis, school resource officer with the Edwardsville Police Department. “It is when LEFI became defunct that Metro East officers took it upon themselves to keep the camp going,” Davis said. This year, 21 children are participating in the free camp that offers a weeklong of recreational activities and teambuilding exercises. Campers receive breakfast, lunch, two T-shirts and transportation to and from camp, according to Mark Terveer, Collinsville school resource officer. 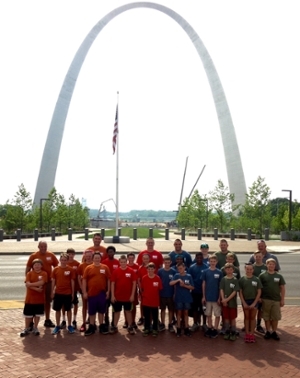 Police and Children Together campers and Metro East law enforcement officers enjoy a day at the St. Louis Arch.